Articulate Education UK: ARTiculate Bulletin #5 - Have you tried The Shape Game by Anthony Browne? ARTiculate Bulletin #5 - Have you tried The Shape Game by Anthony Browne? 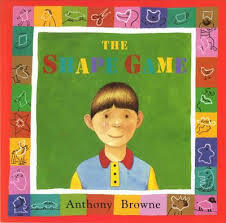 Get your new year off to a flyer with Anthony Browne's excellent The Shape Game. The perfect starting point for short, simple activities to get your class talking, discussing, drawing and working together. A 'Have You Tried?' ideas sheet for The Shape Game can be found here. The Shape Game is all you really need in order to understand the magic of Anthony Browne. On a family trip to the Tate Britain art gallery in London, Anthony Browne gives us insight into his love of art and his childhood discovery of visual jokes and lends us a launch pad from which to analyse paintings, decode symbols and interpret art. Ideas for talking and thinking: Interpret and discuss meaning in art and look for symbols in paintings. Ideas for writing: Collaborative written interpretations of famous artworks. Ideas for art: Play the shape game like Anthony Browne turning doodled shapes into pictures!